Sweet Marjoram essential oil (organic) (1 ml) + Neroli essential oil (organic) (1 ml) + Roman chamomile essential oil (organic) (1 ml) + Ylang Ylang complete essential oil (organic) (1.5 ml) . Apply 2 to 3 drops of this mixture 3 to 4 times a day on the solar plexus and the inside of the wrists. Sweet Marjoram essential oil (organic) (2 ml) + Basil exotic essential oil (organic) (2 ml) + Ginger essential oil (organic) (2 ml) + Maritime Pine essential oil (2 ml) + Sweet almond oil (organic) (4 ml) . Massage your lower back and abdomen 3x/day for 7 days. Sweet Marjoram essential oil (organic) (2 ml) + Peppermint essential oil (organic) (2 ml) + Rose essential oil (organic) (2 ml) + Spikenard essential oil (organic) (2 ml) + Roman chamomile essential oil (organic) (2 ml) . Apply the mixture of essential oils to massage the solar plexus, the middle of the lower back and inside of the wrists. Repeat if necessary. Inhale oils that you put on your wrists. Sweet Marjoram essential oil (organic) (1 ml) + Cumin essential oil (organic) (1 ml) + Myrrh essential oil (1 ml) + Olive oil (organic) (10 ml) . Mix these ingredients in a bottle of 15 ml. Shake well. Rub 3-4 drops of the synergy of essential oils on the solar plexus. 3 times a day for a week. Sweet Marjoram essential oil (organic) (0.5 ml) + Ylang Ylang essential oil II (organic) (1 ml) + Tarragon essential oil (0.5 ml) + Lemon balm essential oil organic (0.5 ml) + Petitgrain essential oil (organic) (1 ml) + Jojoba Oil (organic) (30 ml) . Apply to the solar plexus 3 to 4 drops of this mixture 3 times a day. 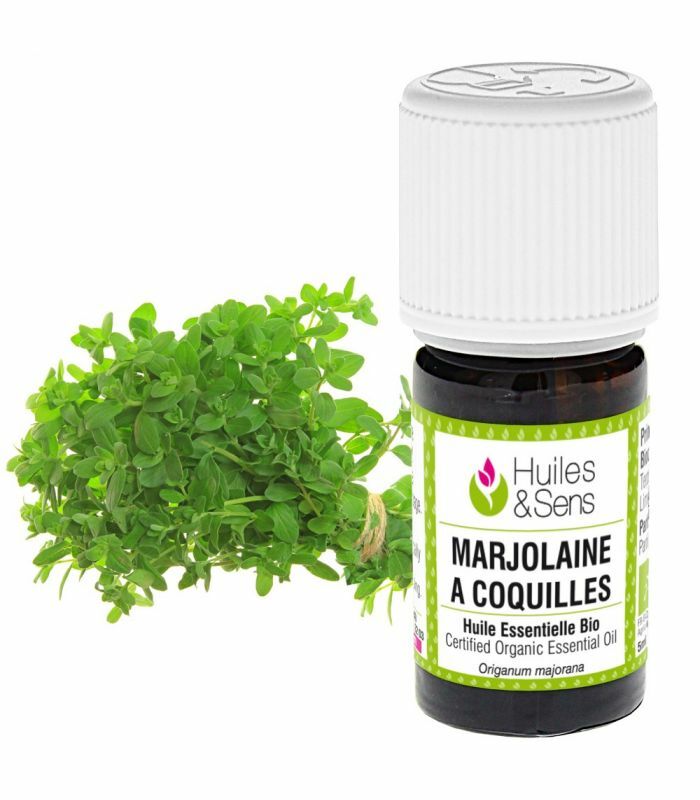 Sweet Marjoram essential oil (organic) (6 drops) + Coriander essential oil (organic) (3 drops) + Tarragon essential oil (6 drops) + Lavandin super essential oil (organic) (3 drops) + Peppermint essential oil (organic) (3 drops) + Sweet almond oil (organic) (9 drops) . Massage the abdomen and lower back 3x/day with ten drops of the mixture. Sweet Marjoram essential oil (organic) (2 ml) + Sweet orange essential oil (organic) (2 ml) + Lavender essential oil (organic) (3 ml) + Jojoba Oil (organic) (5 ml) . Make this preparation using essential oils and vegetable oil in the proportions indicated. Rub a few drops on the solar plexus and the arch of the foot twice a day (including once before bedtime). Sweet Marjoram essential oil (organic) (1 ml) + Sage essential oil (organic) (1 ml) . Prepare this lotion in a bottle. Apply twice a day morning and evening in light circular massage of the lower abdomen. Use only a few drops at a time. This lotion is also for irregular mood. Sweet Marjoram essential oil (organic) (1 ml) + Ledum essential oil (organic) (1 ml) + Lavender essential oil (organic) (1 ml) + Ravintsara essential oil (organic) (1 ml) + Lavandin super essential oil (organic) (1 ml) + Mandarin green essential oil (1 ml) + Sweet almond oil (organic) (25 ml) . This preparation is for use in massage (chest, sole of the feet) 3 times a day (including friction for 10 minutes before bedtime). You may add verbena essential oil (0.5 ml) to further improve synergy. Sweet Marjoram essential oil (organic) (1 ml) + Lavender essential oil (organic) (1 ml) + Petitgrain essential oil (organic) (1 ml) + Bay Laurel essential oil (organic) (1 ml) + Sweet almond oil (organic) (50 ml) . Prepare this mixture with the essential oils and vegetable oil indicated. Apply a few drops on the chest and inside the wrists. You can also soak a handkerchief with a few drops of pure composition (i.e. no vegetable oil) to inhale from time to time. Sweet Marjoram essential oil (organic) (7 ml) + Petitgrain essential oil (organic) (5 ml) + Mandarin green essential oil (7 ml) + Macadamianut Oil (organic) (30 ml) . Prepare this lotion in a 50-ml bottle. Apply 4 to 5 drops of this mixture to the solar plexus every morning and evening. Sweet Marjoram essential oil (organic) (1 ml) + Lavender essential oil (organic) (1 ml) + Vervain essential oil (0.5 ml) + Mandarin green essential oil (1 ml) . Fill an inhalator stick with a few drops of this essential oil mixture. Smell the oils as soon as the first signs of stress appear. 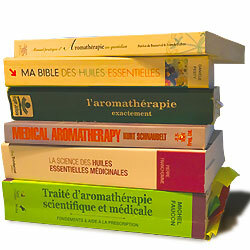 You can also prepare a massage oil with this synergie. Sweet Marjoram essential oil (organic) (2 drops) + Rosewood essential oil (organic) (2 drops) + Tea-tree essential oil (organic) (2 drops) + Rosemary verbenone essential oil (organic) (2 drops) + Neroli essential oil (organic) (2 drops) + Vervain essential oil (2 drops) . Massage the middle of the back, the arch of the foot and the solar plexus with this blend of essential oils. Also rub the inside of the wrists and inhale the mix deeply.